I have to admit that I can't really get behind all the principles of Leave No Trace. I mean, it's a good theory, definitely, and I agree with the general concept that we shouldn't go mucking up nature. But taken to its extreme, Leave No Trace removes all human activity from the wilderness experience, and in doing do negates the whole point of the wilderness experience: people are not going to want to protect and preserve things that they don't love, and they're not going to love things they can't tangibly enjoy, and sometimes tangible enjoyment involves things like hunting or fishing or picking wildflowers or hiking off-trail. Or picking thimbleberries, which are ripe now. They're a little late, thanks to the cold and wet spring, but other weather conditions must have been perfect for them because they are everywhere, much more prolific than I can remember in recent years. I went for a walk through Chester Park, which is mostly mixed deciduous with many sunny patches (in other words, perfect for thimbleberries) and walked about a mile and in the course of my walk ate maybe a pint of thimbleberries. I didn't think there was a limit to how many thimbleberries a person can eat, but there is, and it's about a pint. Not that that really stopped me. The logical part of my brain was thinking, "Don't be greedy. Even if there is so much fruit it's rotting on the vine, leave some for other people, or for critters. Besides, aren't you starting to get a little sick?" But then the illogical, primal part of my brain countered with, "But... thimbleberries! Must gorge self on thimbleberries. Have no choice." Guess which part won out. Thimbleberries are a fruit that will never be grown commercially, since they are so fragile it is not uncommon for the berries to fall apart in your fingertips; it takes a skilled, delicate touch to be able to pick them without squishing or dropping the berry. As you can probably guess by the berry shape and Latin name (Rubus parviflorus) they are related to raspberries, and the flavor is similar, but much more complex. Think raspberries mixed with tart green apples and just a touch of peppery cinnamon spice. I do not have the facilities (nor equipment, nor experience) to try this myself, but I bet they'd make a really excellent wine. 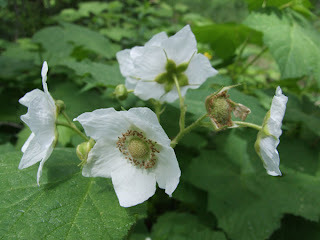 Thimbleberries (also called large flowering raspberry, white flowering raspberry, or salmonberry) grow on thornless stalks in dense, tangled clumps that often fill in understory of a sunny or freshly-disturbed forest. The plants usually top off around two to three feet tall, and the leaves are huge and maple-shaped, sometimes up to eight inches across. The flowers are equally conspicuous, two to three inches across, white (sometimes purple), and as flimsy as tissue paper. The first time I saw the plant I was convinced that it had to be some alien invasive. Those huge leaves, those huge flowers, that spreading habit—northern plants are not that extravagant. But it's native to the US, and is largely a western species, although the distribution creeps out across the Great Lakes states and into Massachusetts. (I think Thoreau mentioned them... in Wild Fruits maybe? I don't have that book with me at the moment.) In Duluth, the flowers come in late June/early July, and the fruit usually ripens in early August. Happy to find your blog. I was glad the berries were late because I headed out one day afraid I'd missed them and found many along Tischer. 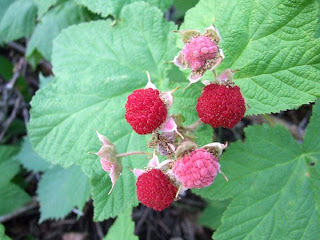 I lived in Thoreau country most of my life, but didn't know thimbleberries until I moved here. Last week I mentioned them to a woodsy friend out there and she didn't know them. So I just checked Wild Fruits and he appears to be talking about a whole nother fruit unless there's a black variety. You're right, he's talking about a different plant. I just saw the USDA distribution map and had the vague memory of a lot of familiar north woodsy stuff being mentioned in Wild Fruits, and I just assumed. But his thimbleberries are some Rubus species, too, and I'd like to know what they are. It's not anything I recognize from his description (and I can't imagine anyone being able to string up our thimbleberries, Rubus parviflorus, on a blade of grass; his thimbleberries have to be far sturdier than ours).